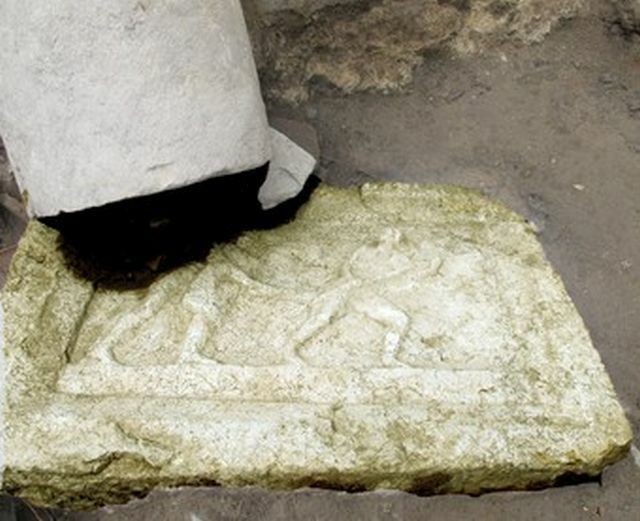 A marble slab from the frieze of an ancient temple in the Roman city of Augusta Traiana depicting two fighting gladiators has been discovered together with herms and an inscription mentioning Roman Caesars during rescue archaeological excavations in the southern Bulgarian city of Stara Zagora. The marble slab which is 115 cm long and 83 cm wide has been discovered by archaeologist Maria Kamisheva from the Stara Zagora Regional Museum of History, reports the Bulgarian daily Duma. The slab is decorated with the clearly visible depictions of two gladiators – one of them attacking with a sword and a shield, and another who seems to be retreating, holding a spear and a trident. The gladiator slab was most probably part of the frieze – the central part of an entablature of ancient buildings often decorated with reliefs – of a Roman temple in the city of Augusta Traiana. The archaeologists carrying out the rescue excavations have also found two herms – sculptures with human heads above a plain lower section. The herms come from the same Roman temple. Both are decorated with male heads wearing what appear to be gladiator helmets. Another exciting discovery is a donor’s inscription stating the exact year when the Augusta Traiana temple was built – 303 AD. The inscription says the temple was erected by the governor of the Roman province of Thrace, Emilius Alexander, “for the glory of Roman Caesars Galerius Valerius Maximianus and Flavius Valerius Constantius” (i.e. Galerius and Constantius Chlorus). Galerius and Constantius were part of the so called Tetrarchy, a government system introduced by Roman Emperor Diocletian (r. 284-305 AD) in which the Empire was governed by two Augusti (Senior Emperors) and two Caesars (Junior Emperors). 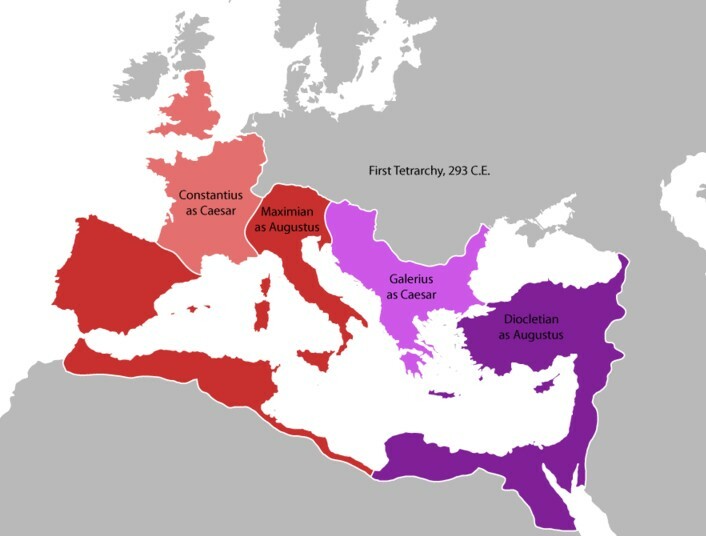 When the Tetrarchy was set up in 293 AD (the so called First Tetrarchy), Diocletian ruled the East of the Roman Empire as Augustus together with Galerius as Caesar, and Maximian ruled the West of the Roman Empire as Augustus together with Constantius Chlorus as Caesar. Thus, Galerius (Galerius Valerius Maximianus) ruled in 293-305 AD as Caesar under Emperor Diocletian and in 305-311 AD as Augustus alongside Constantius, then Severus, then Constantine; and Constantius Chlorus (Flavius Valerius Constantius) ruled in 293-305 AD as Caesar under Maximian, and in 305-306 AD as Augustus alongside Galerius. The donor’s inscription with the names of the Roman Caesars Galerius and Constantius Chlorus is the third donor’s inscription to have been found at the site in the downtown of Bulgaria’s Stara Zagora which is being excavated at present, with archaeologist Maria Kamisheva expecting more finds as the digs progress to the earlier archaeological layers. Another archaeological site located about 50 meters away from the excavations of what was a Roman temple has yielded another interesting find – a stone stele with an inscription in Greek which was re-used for construction in the Middle Ages. The inscription has not been read yet but it is said to be dating to the 3rd century AD. Another discovery from the Ancient Roman city of Augusta Traiana in Bulgaria’s Stara Zagora, restored colorful Roman mosaics of “Dionysus’s Procession” from the 4th century AD, are about to be shown to the public for the first time.